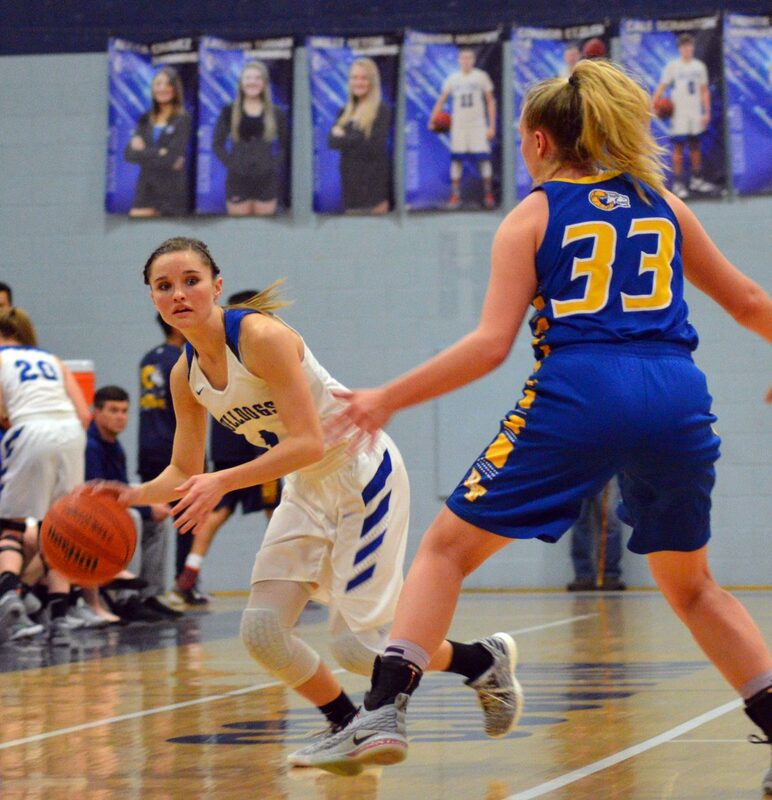 Moffat County High School's Halle Hamilton can't slow down on a fastbreak against Roaring Fork. 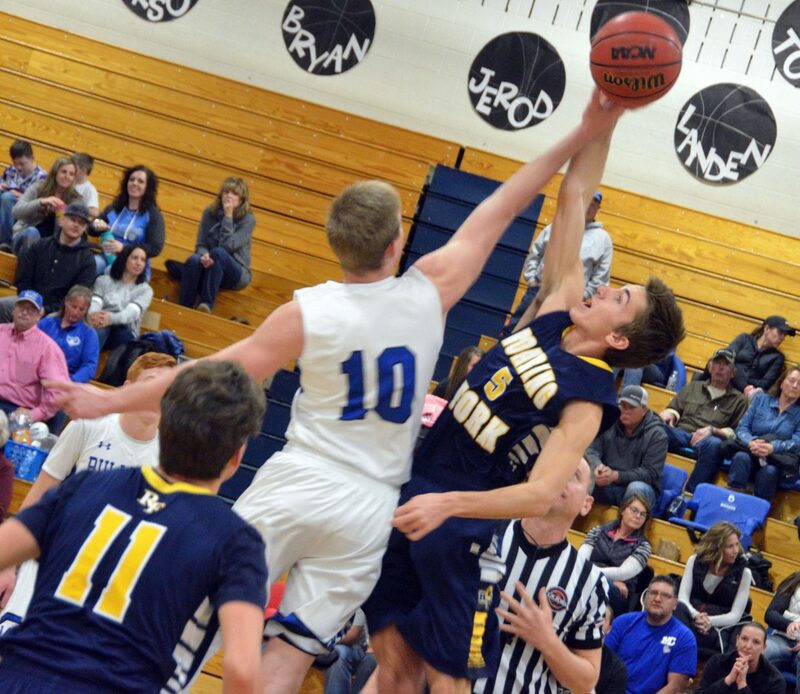 Moffat County High School's Connor Murphy pounds up the court against Roaring Fork. 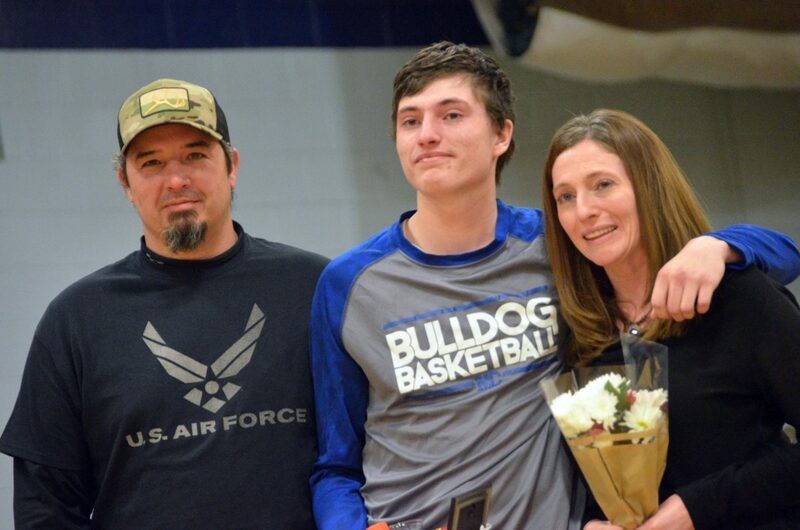 Moffat County High School's Connor Etzler is honored during Senior Night Saturday. Moffat County High School's Madie Weber unleashes a shot against Roaring Fork. Moffat County High School girls basketball seniors gather before the game against Roaring Fork. From left, Madie Weber, Tiffany Hildebrandt, Brittnee Meats, Sharon Quick, Kinlie Brennise, Quinn Pinnt and Jaidyn Steele. 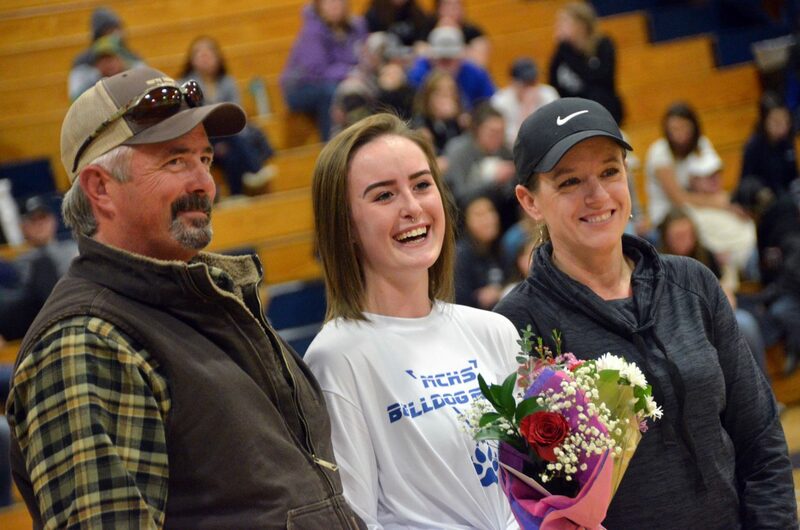 Moffat County High School dance team member Kelsey Stauffer is honored during Senior Night Saturday. 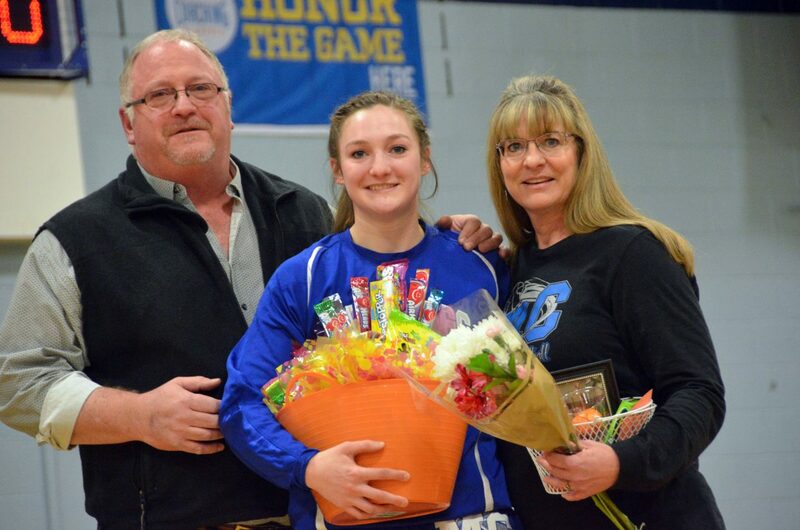 Moffat County High School's Cale Scranton is honored during Senior Night Saturday. 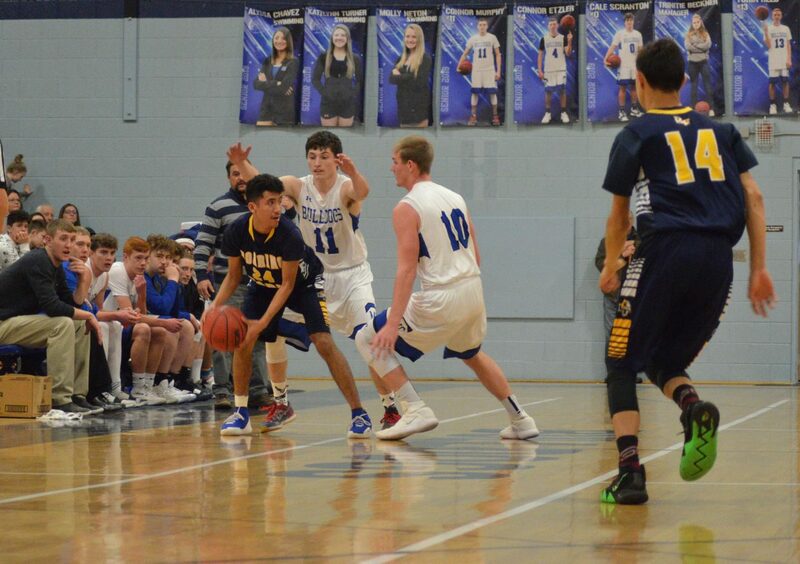 Moffat County High School's Cale Scranton and Victor Silva keep after it defensively against Roaring Fork. Moffat County High School's Ryan Peck looks for a potential pass against Roaring Fork. 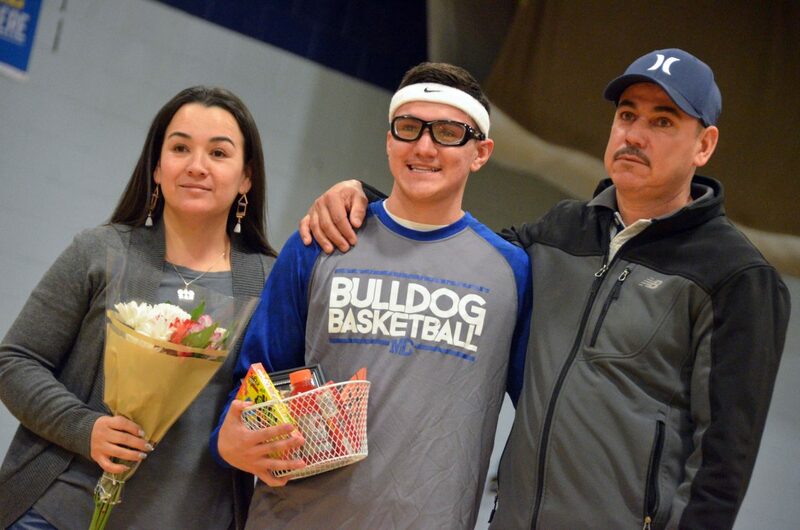 Moffat County High School's Victor Silva is honored during Senior Night Saturday. Moffat County High School's Emaleigh Papierski puts some extra arc on her jumper against Roaring Fork. 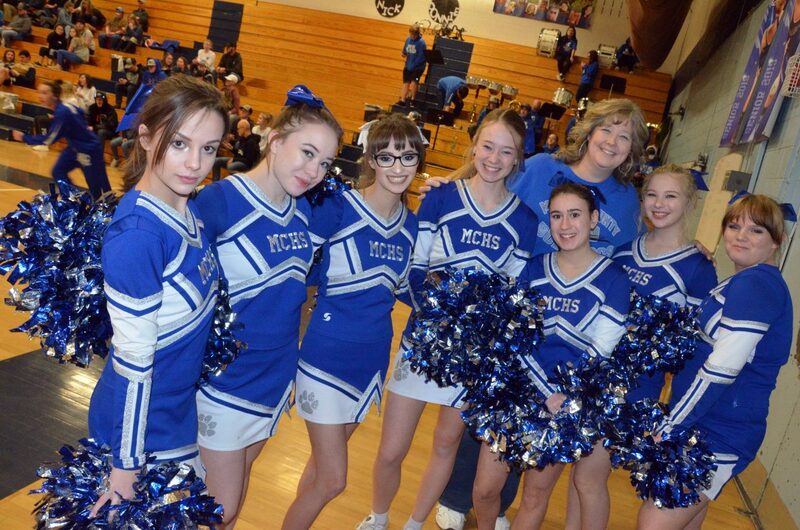 Moffat County High School cheer coach Becky Fritz gathers with the spirit squad. 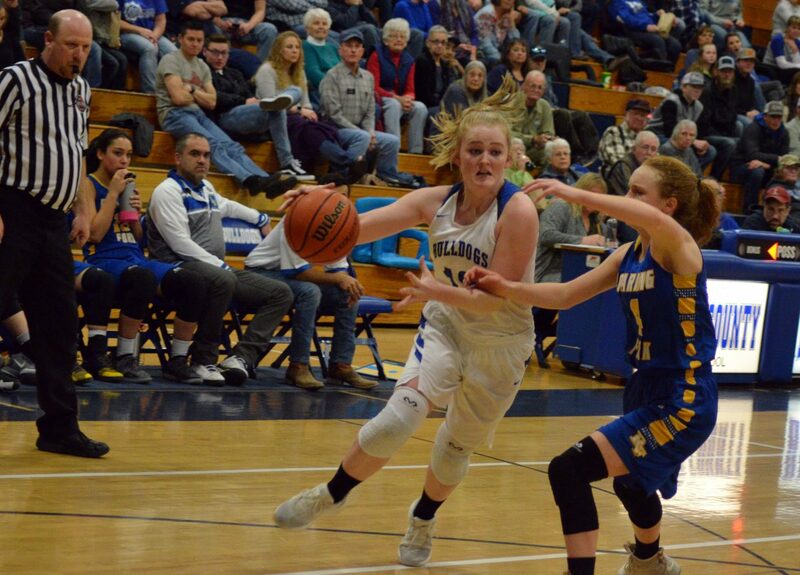 Moffat County High School's Stephenie Swindler maneuvers around Roaring Fork defenders. 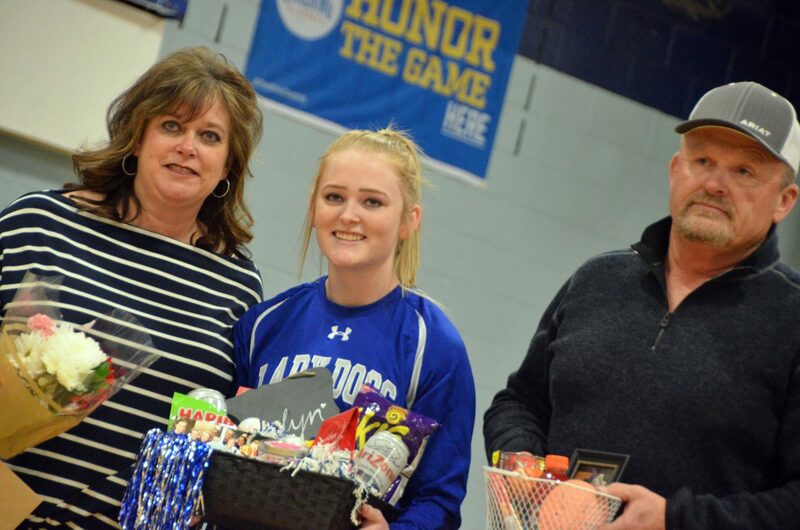 Moffat County High School girls basketball team manager Sharon Quick is honored during Senior Night Saturday. Moffat County High School's Landen Najera, left, and Colby Beaver fan out before an inbound pass shoots from outside against Roaring Fork. 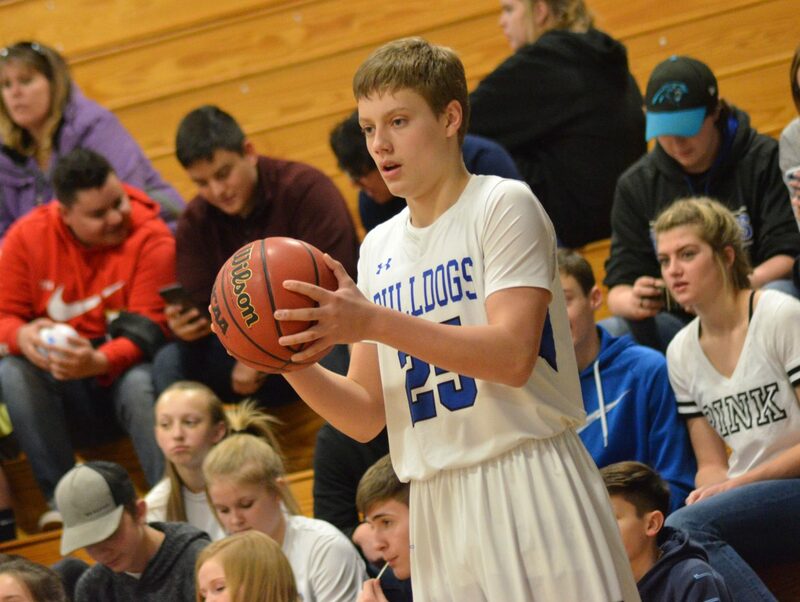 Moffat County High School's Ryan Peck shoots a free throw against Roaring Fork. 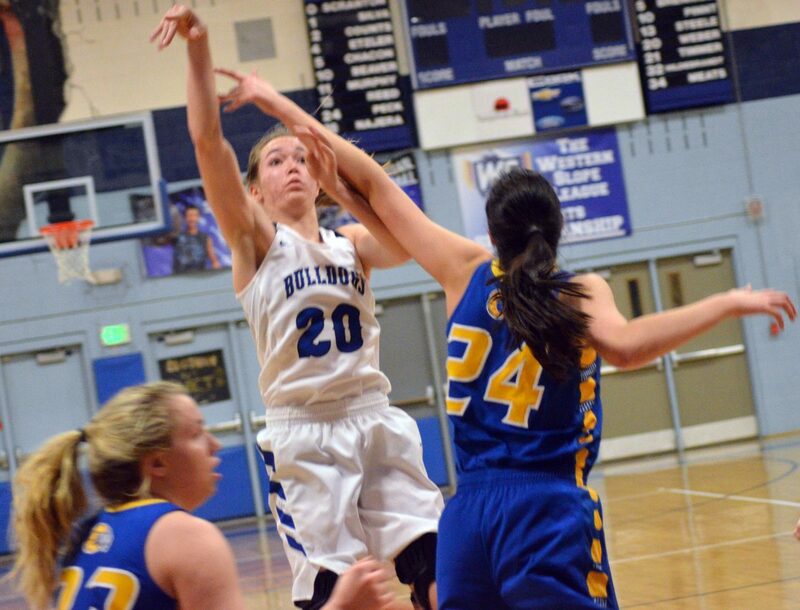 Moffat County High School's Halle Hamilton gets in a shot near the Bulldog basket against Roaring Fork. 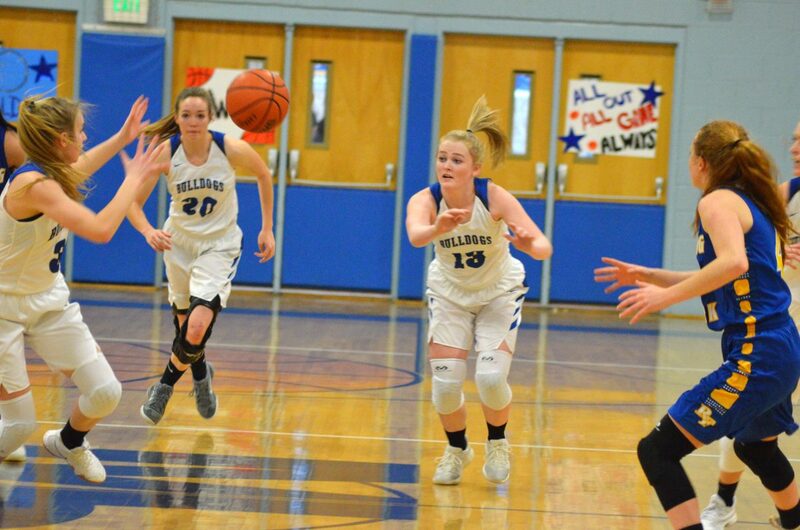 Moffat County High School's Stephenie Swindler makes things difficult for the Roaring Fork inbound. 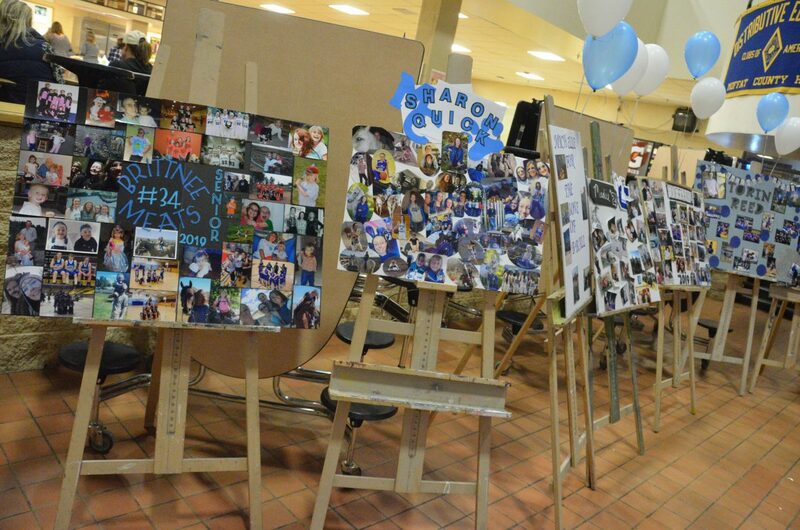 Signs in the Moffat County High School lobby denote Senior Night Saturday. 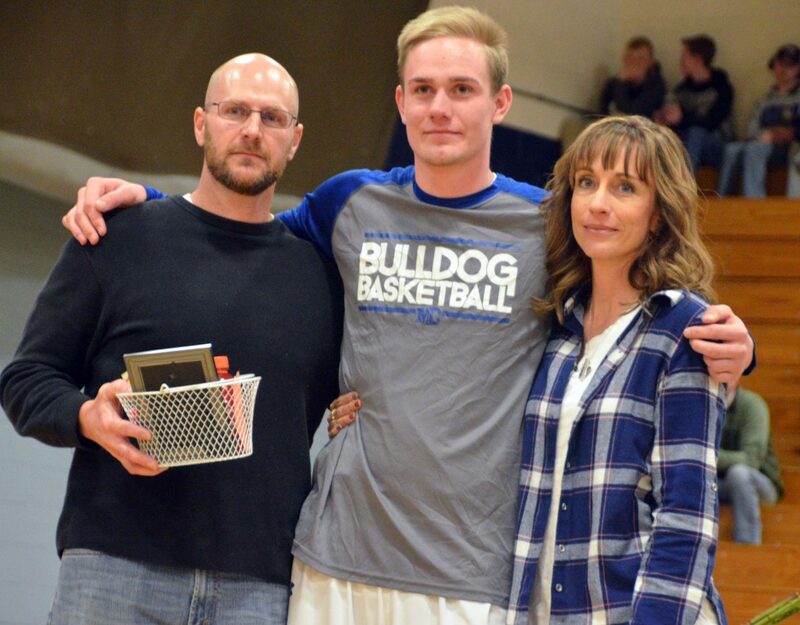 Moffat County High School's Torin Reed is honored during Senior Night Saturday. Moffat County High School flautist Abigail Hall performs the national anthem during Saturday's basketball games. 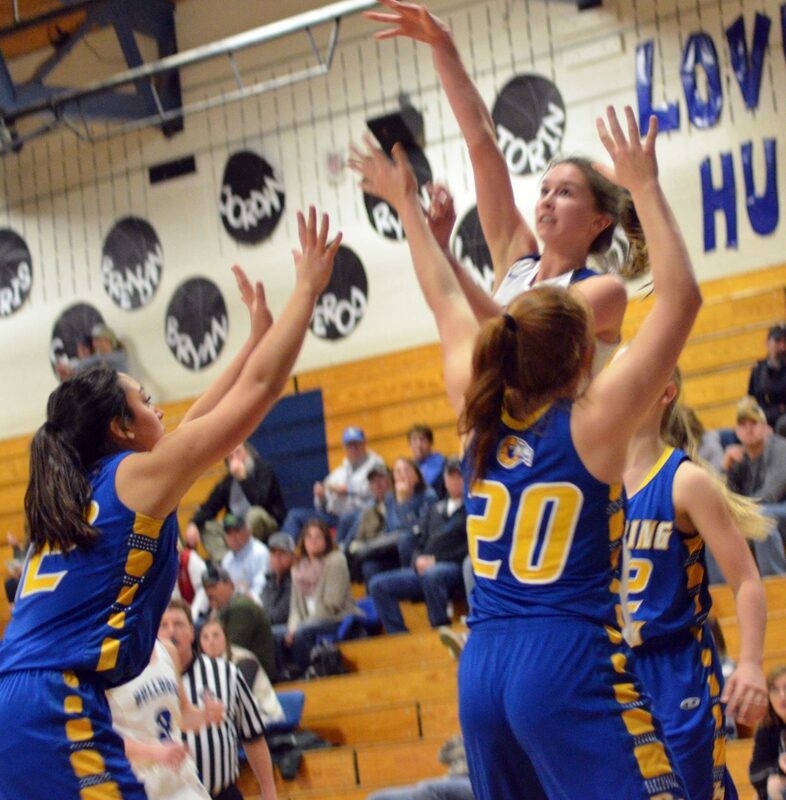 Moffat County High School's Tiffany Hildebrandt steps in and shoots quickly against Roaring Fork. 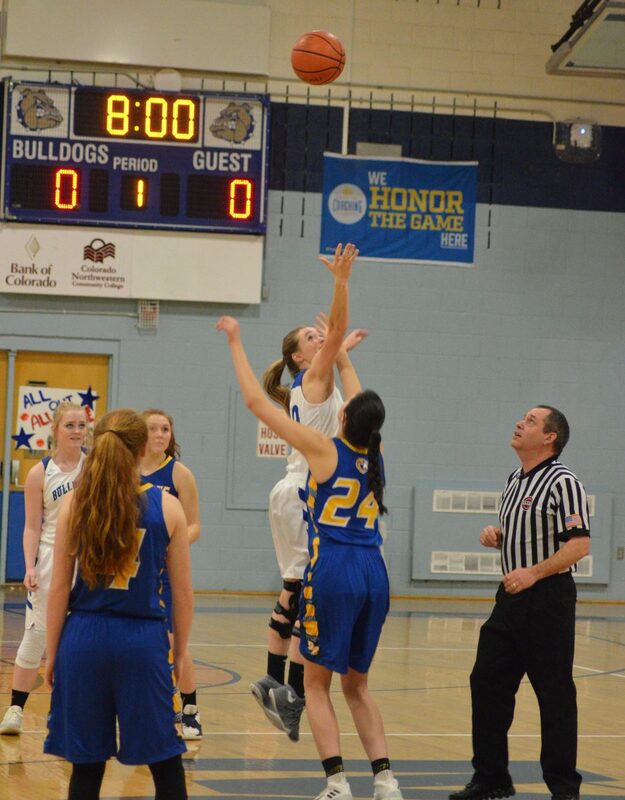 Moffat County High School's Halle Hamilton is coming up fast against Roaring Fork. 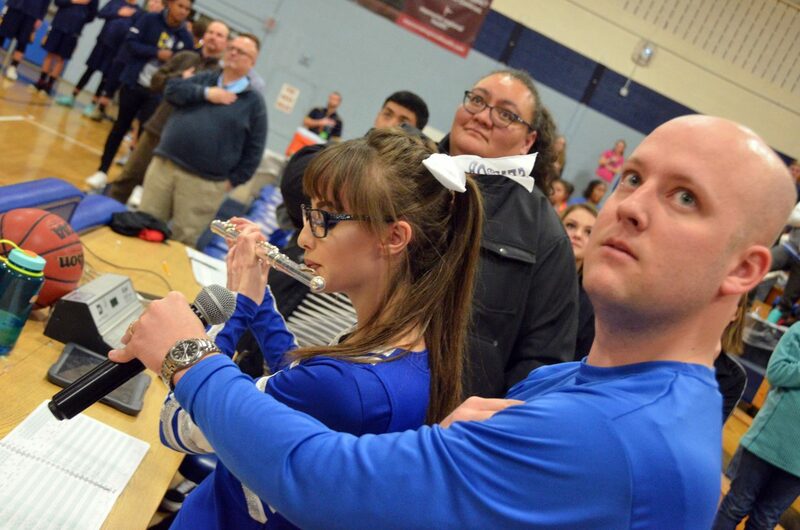 Moffat County High School's Donnie Quick keeps an eye on his Roaring Fork opponent. 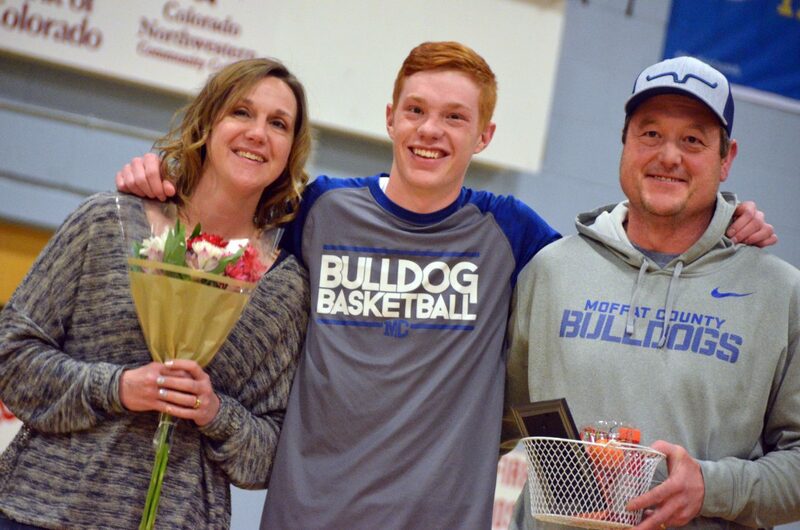 Moffat County High School's Colby Beaver is honored during Senior Night Saturday. 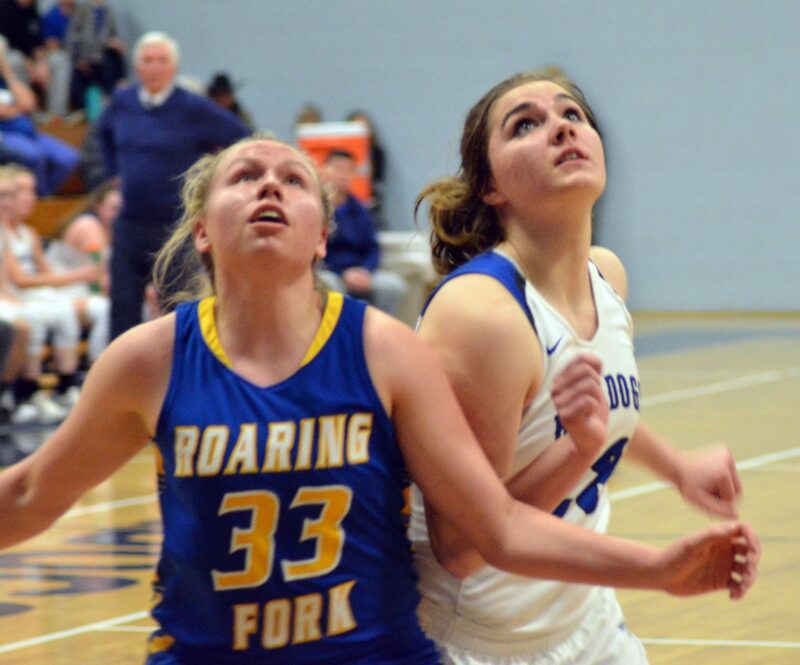 Moffat County High School's Jaidyn Steele, left, and Quinn Pinnt hold strong at half-court against Roaring Fork. 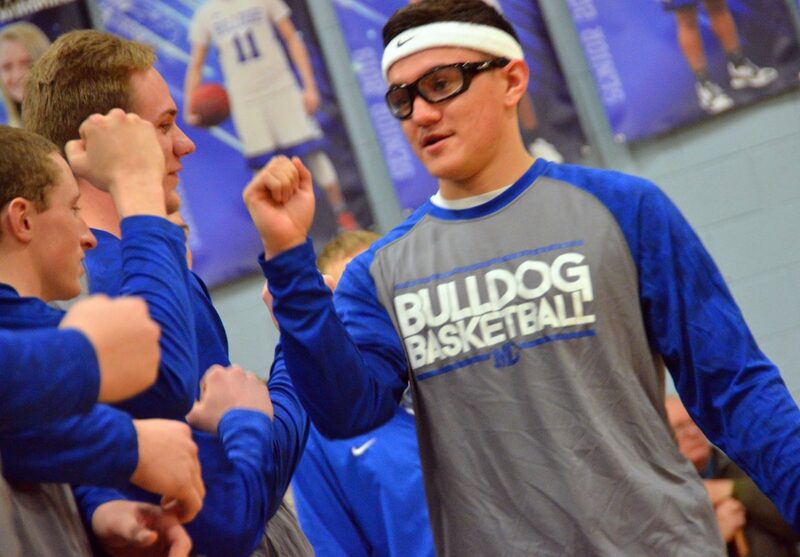 Moffat County High School's Victor Silva engages in fist-bumps with his teammates. 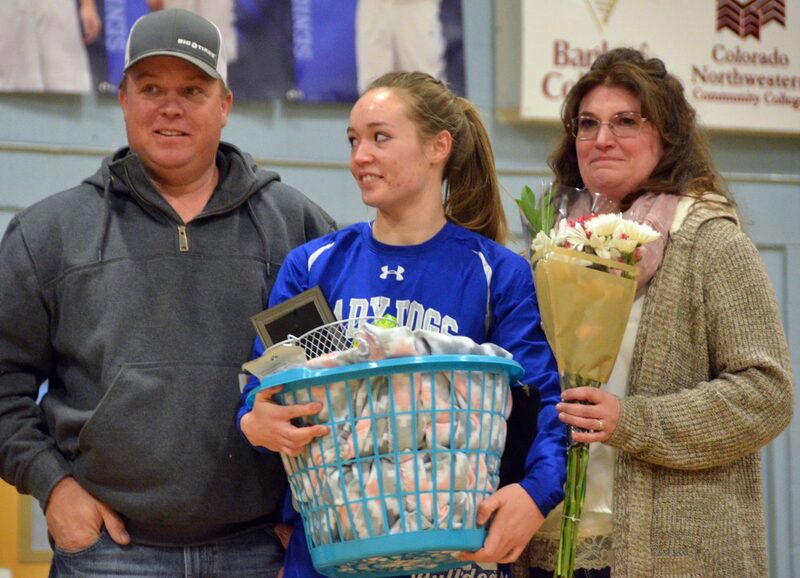 Moffat County High School's Brittnee Meats is honored during Senior Night Saturday. 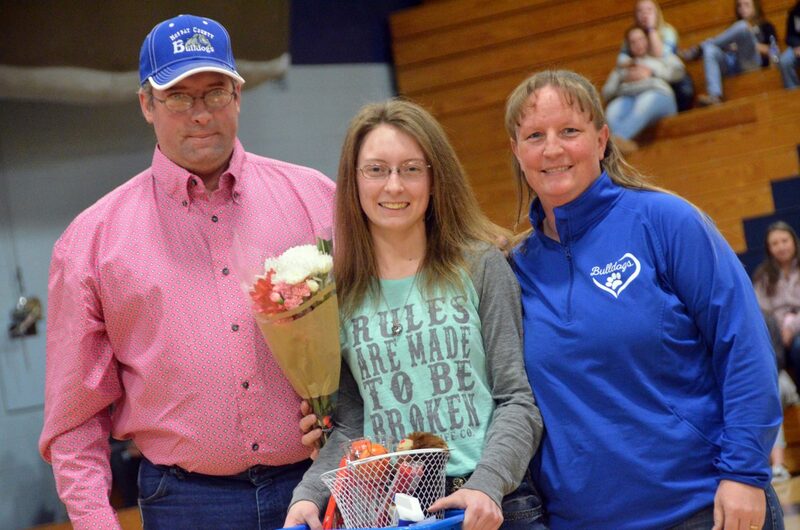 Moffat County High School's Kinlie Brennise is honored during Senior Night Saturday. Moffat County High School's Jerod Chacon gets a good jump and a shot off against Roaring Fork. Moffat County High School's Madie Weber gets a jump on the opening tipoff against Roaring Fork. 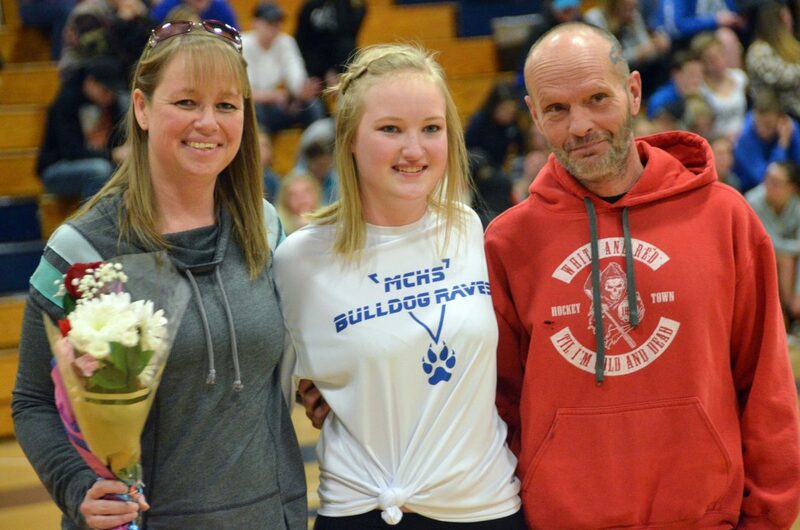 Moffat County High School's Madie Weber is honored during Senior Night Saturday. 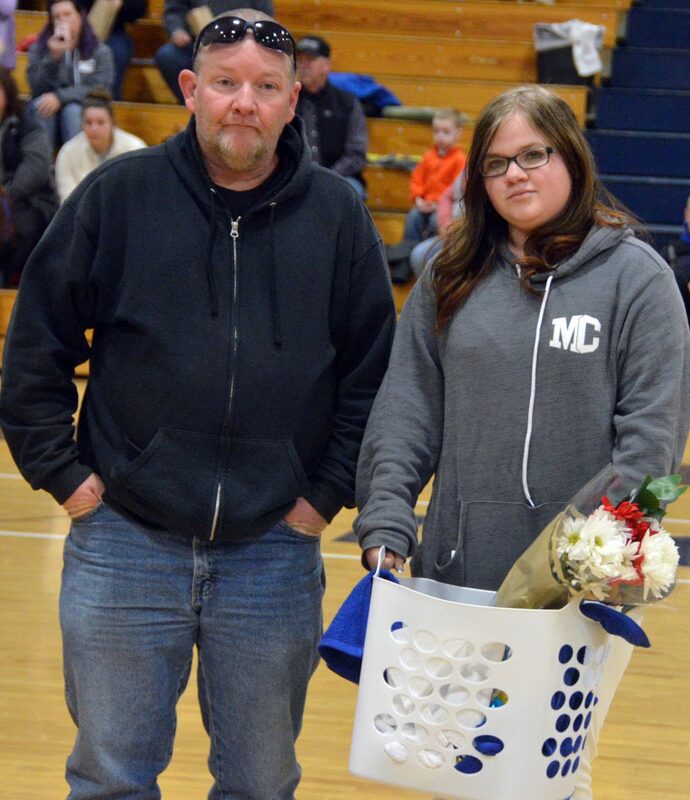 Moffat County High School girls basketball team manager Michelle Shingleton is honored during Senior Night Saturday. Moffat County High School's Connor Murphy shoots from outside against Roaring Fork. 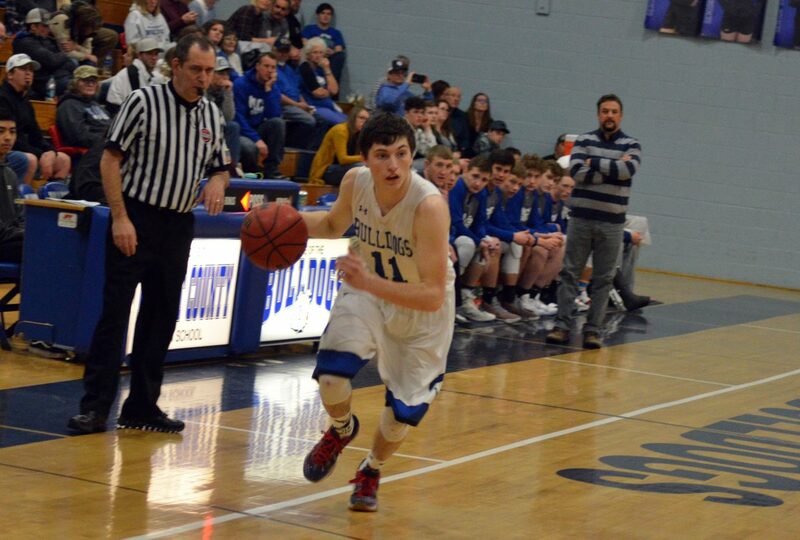 Moffat County High School's Cale Scranton readies for the rebound against Roaring Fork. 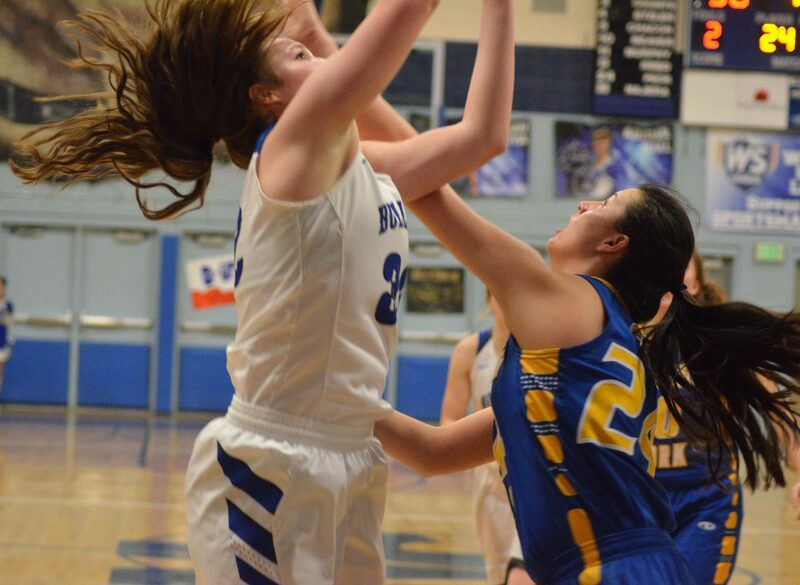 Moffat County High School's Jenna Timmer jostles under the bucket against Roaring Fork. Moffat County High School's Tiffany Hildebrandt stops short at the whistle against Roaring Fork. 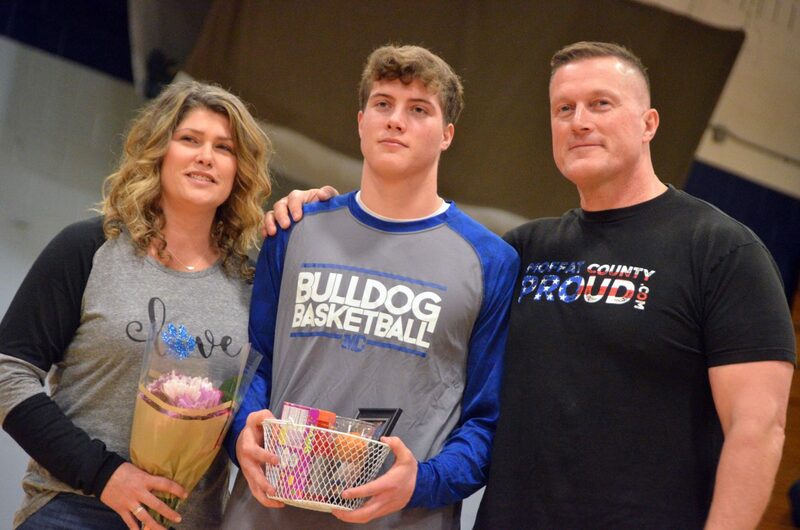 Moffat County High School's Connor Murphy is honored during Senior Night Saturday. 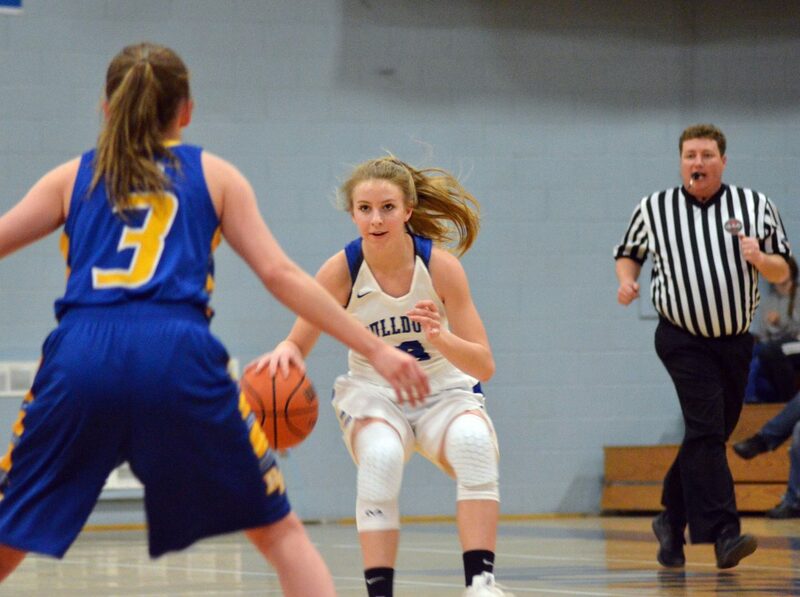 Moffat County High School's Madie Weber knocks away the ball from Roaring Fork and chases after it. Moffat County High School's Jaidyn Steele drives into the paint against Roaring Fork. Moffat County High School's Torin Reed puts up a three-pointer against Roaring Fork. 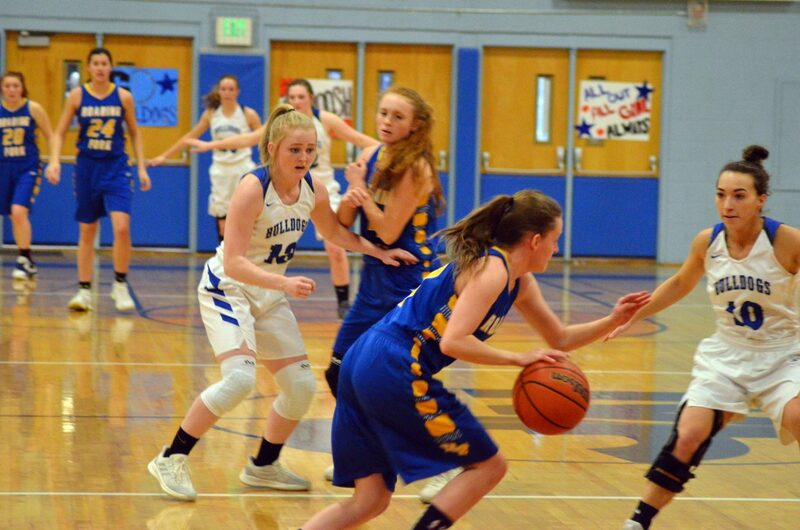 Moffat County High School defenders slow down the Roaring Fork movement. 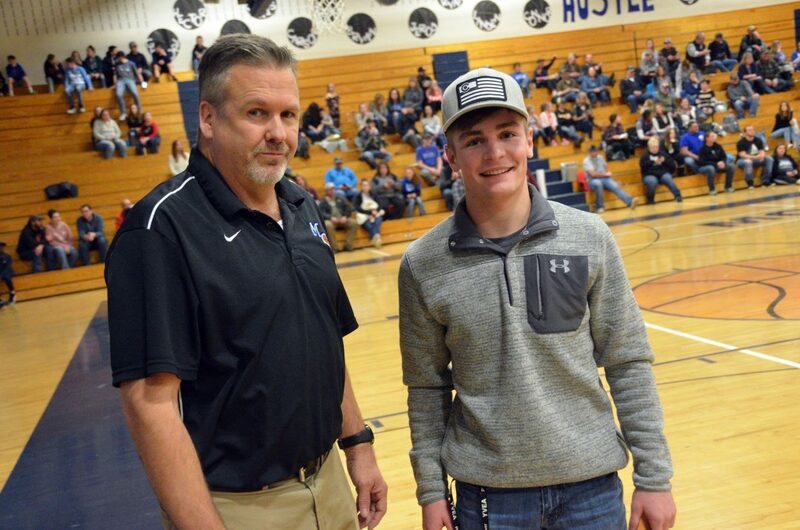 Moffat County High School Athletic Director Bobby Howard leads Daylon Frentress to collect his prize after winning a drawing Saturday. Frentress won a prize package worth $1,000 at Olde Town Hot Springs. 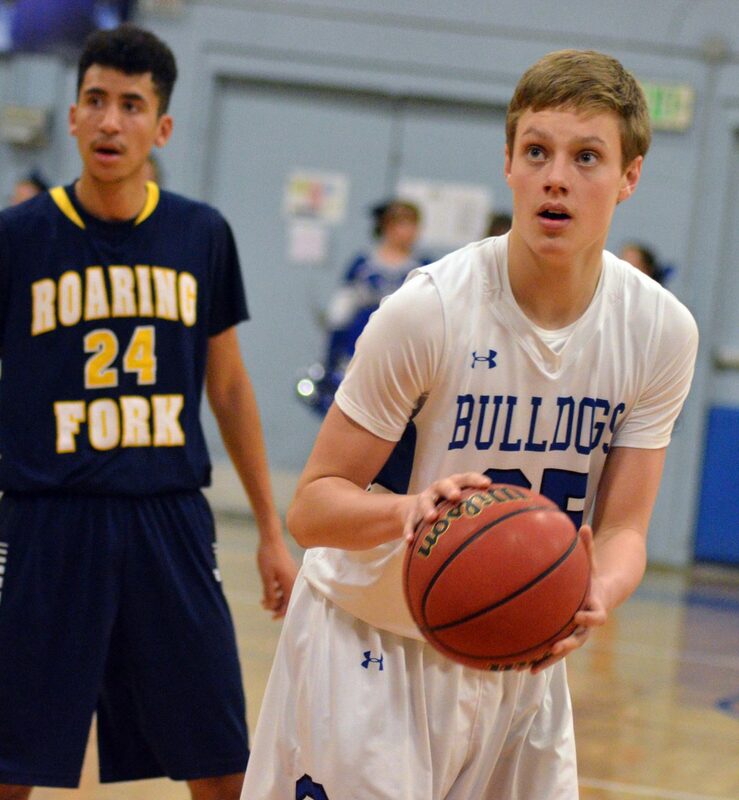 Moffat County High School's Connor Etzler rethinks his route against Roaring Fork. 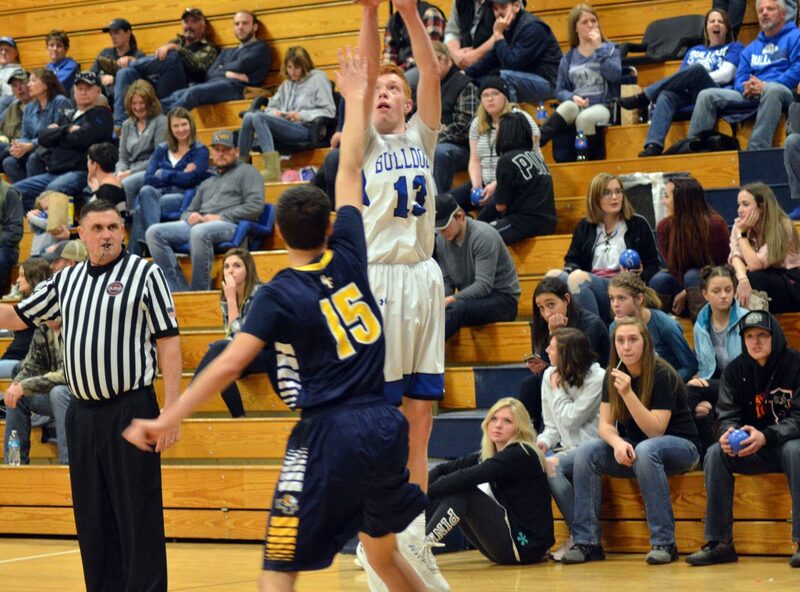 Moffat County High School's Colby Beaver takes the opening tipoff against Roaring Fork. 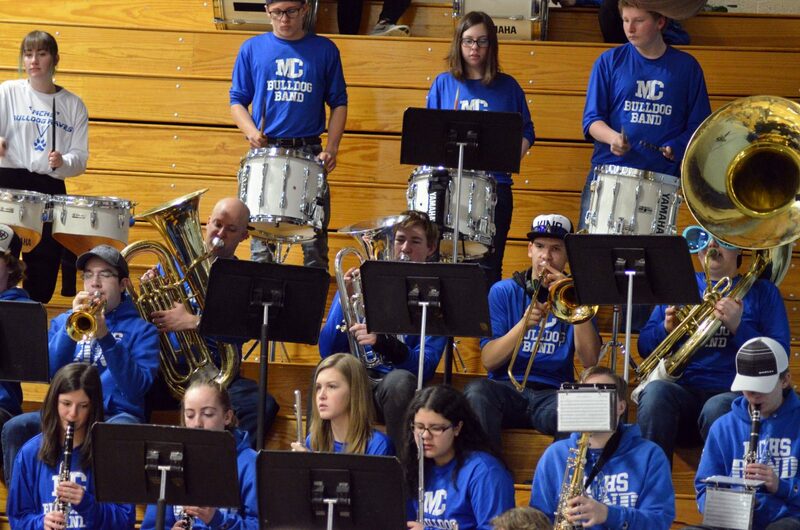 The Moffat County High School band performs during a timeout Saturday. 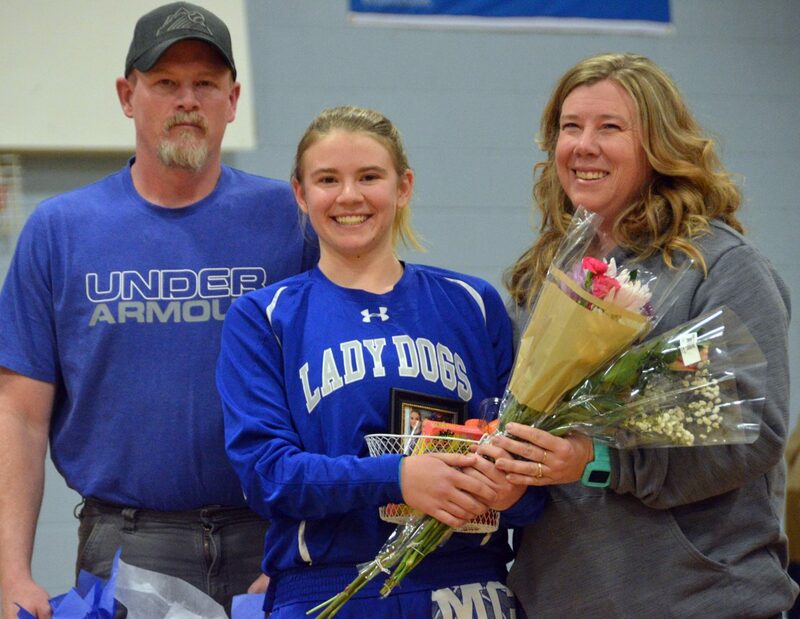 Moffat County High School's Tiffany Hildebrandt is honored during Senior Night Saturday. 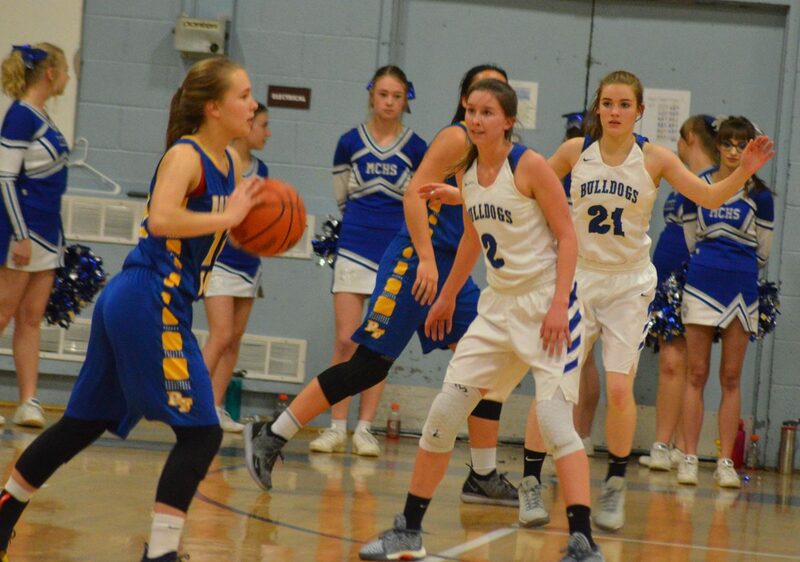 Moffat County High School's Emaleigh Papierski, left, and Payton Voloshin stay defensive late in the game against Roaring Fork. Moffat County High School's Jaidyn Steele foists off the ball after a steal against Roaring Fork. 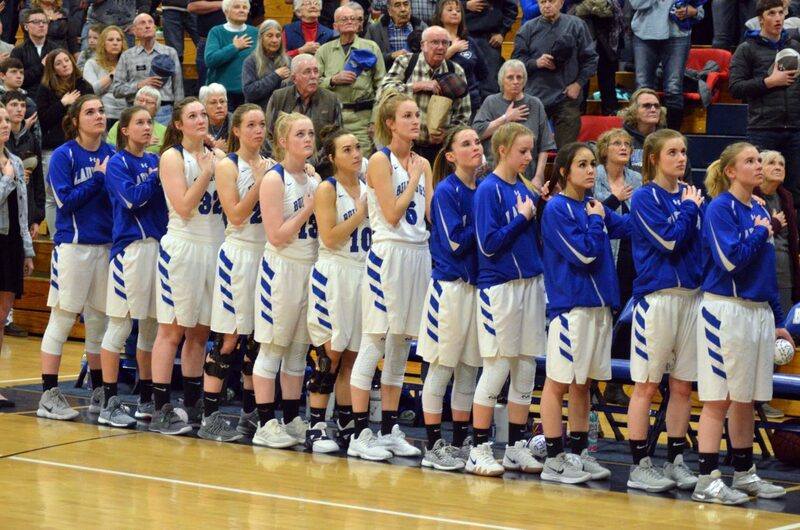 Members of the Moffat County High School girls basketball team observe the national anthem. 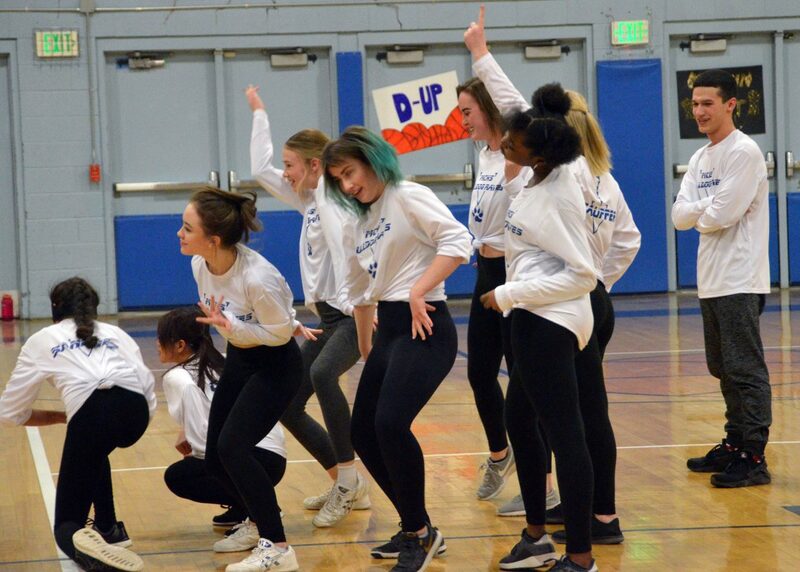 The Moffat County High School Rave Dance Team boogies down at halftime. 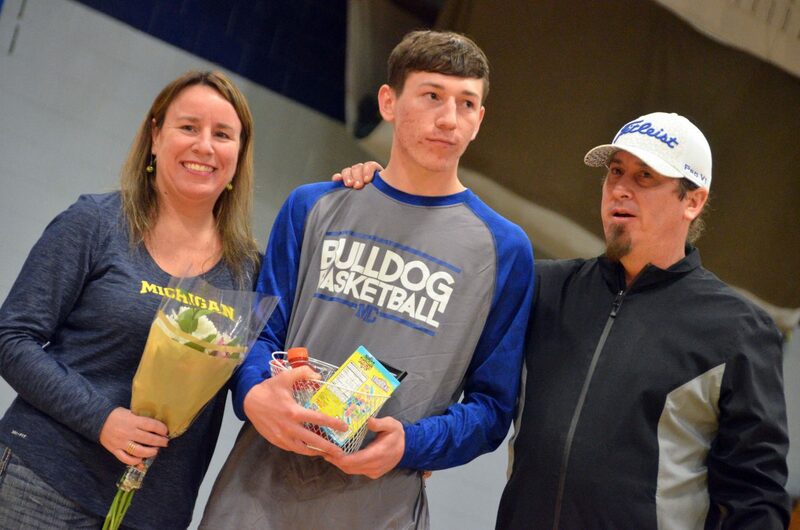 Moffat County High School's Quinn Pinnt is honored during Senior Night Saturday. 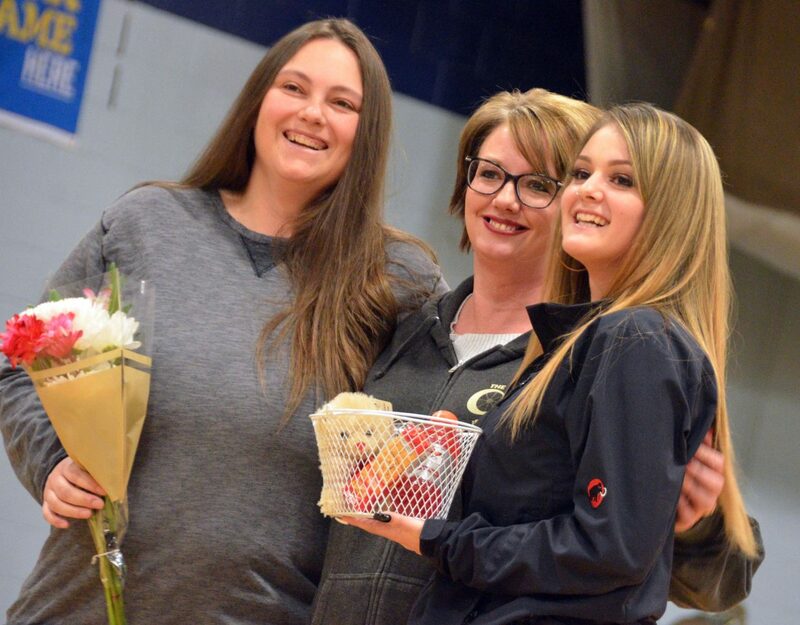 Moffat County High School dance team member Bailey Lawton is honored during Senior Night Saturday. 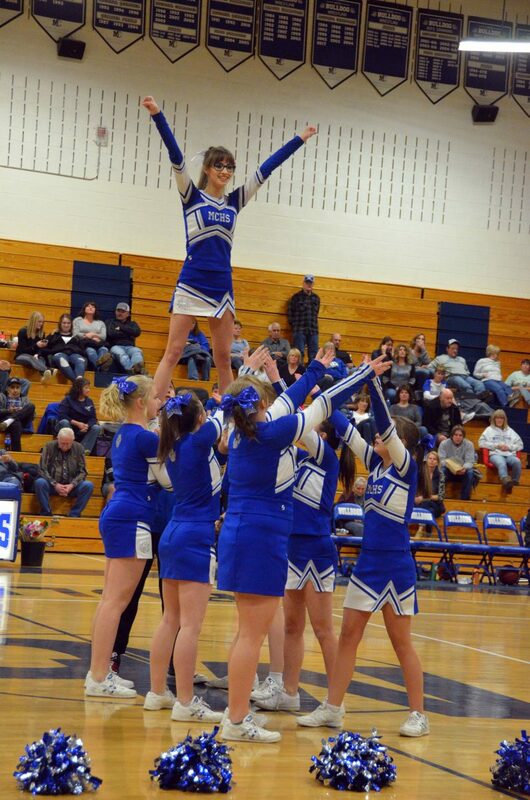 Moffat County High School cheerleaders brace to catch senior spirit squad member Abigail Hall during a stunt. 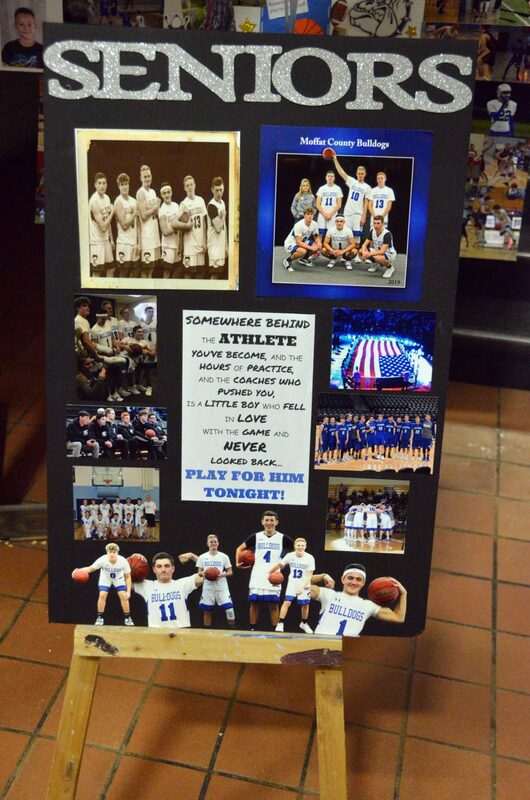 Moffat County High School boys basketball team manager Trinitie Beckner is honored during Senior Night Saturday. 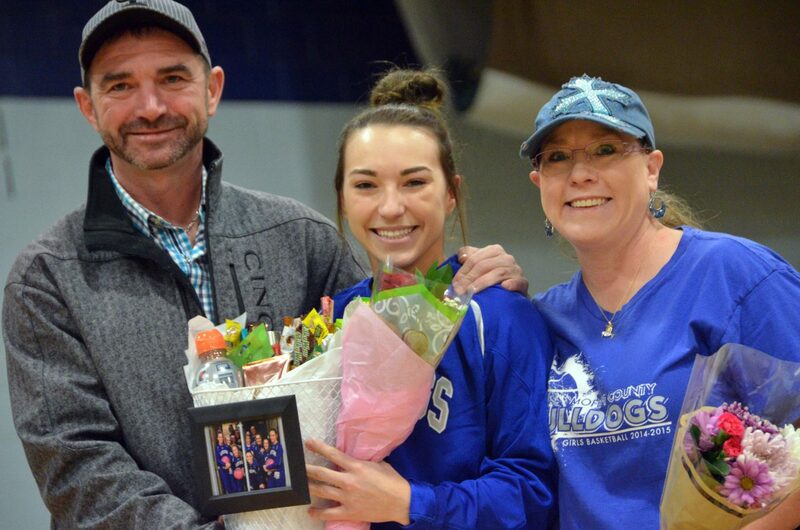 Moffat County High School's Jaidyn Steele is honored during Senior Night Saturday. 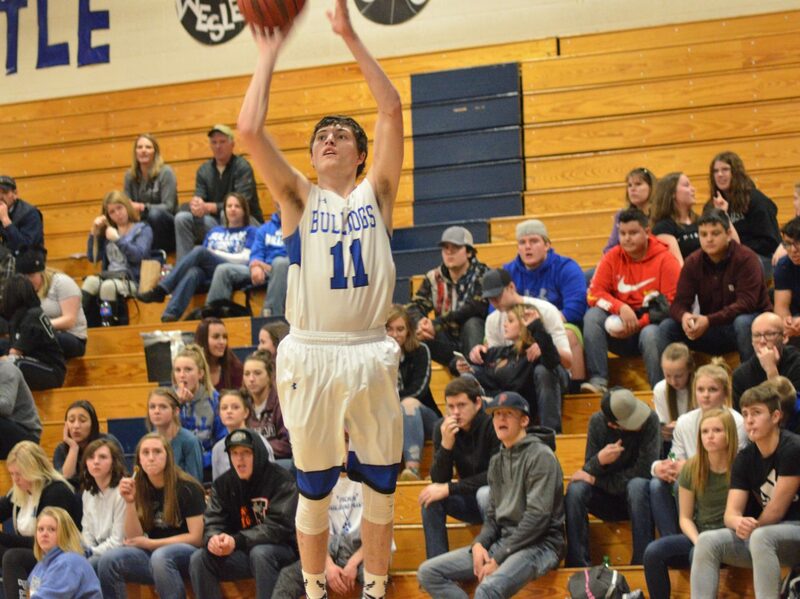 A look back on four years of memories preceded Saturday’s Moffat County High School basketball games, but Bulldogs will be keeping their vision set firmly on the horizon from here. 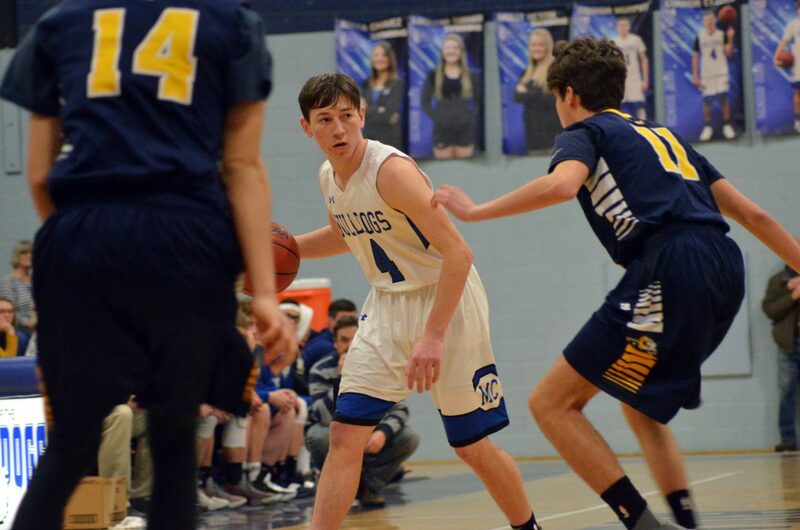 MCHS hoops athletes had Senior Night on their minds during their final home event of the regular season, which, for better or worse, played into their outings with the Roaring Fork Rams as matches that help set the Dogs up for the postseason. 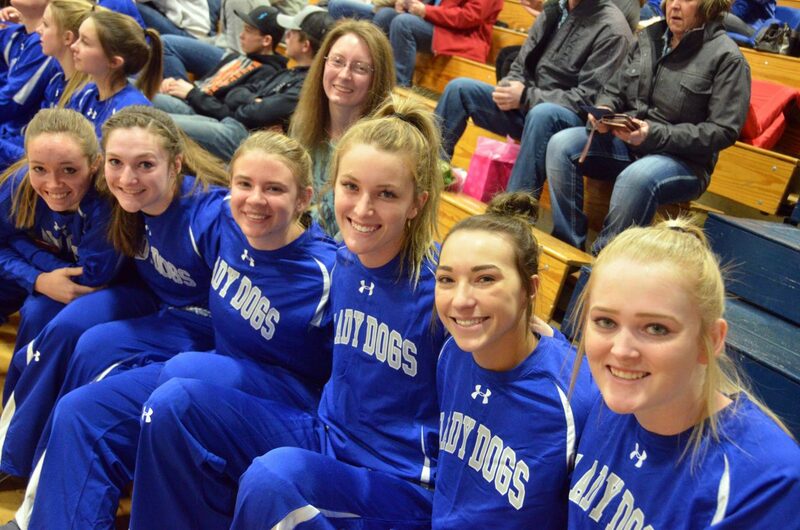 A salute to the oldest members of the Lady Bulldogs highlighted Kinlie Brennise, Quinn Pinnt, Jaidyn Steele, Madie Weber, Tiffany Hildebrandt and Brittnee Meats, as well as managers Sharon Quick and Michelle Shingleton. 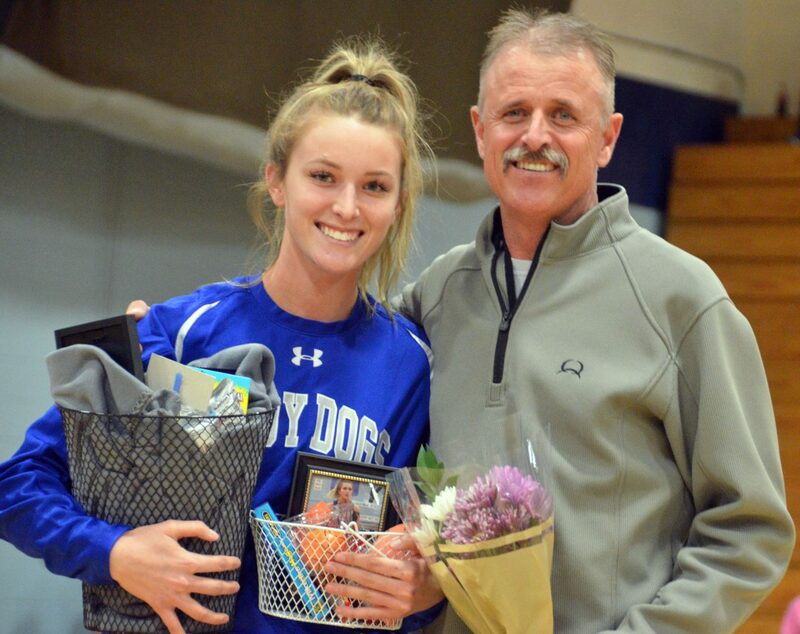 The emotional ceremony, coupled with the previous night’s physically draining game in Granby, led to a molasses-slow start for MoCo girls’ offense, picking up no points for nearly the first four minutes until Brennise got the Dogs on the board with a free throw. 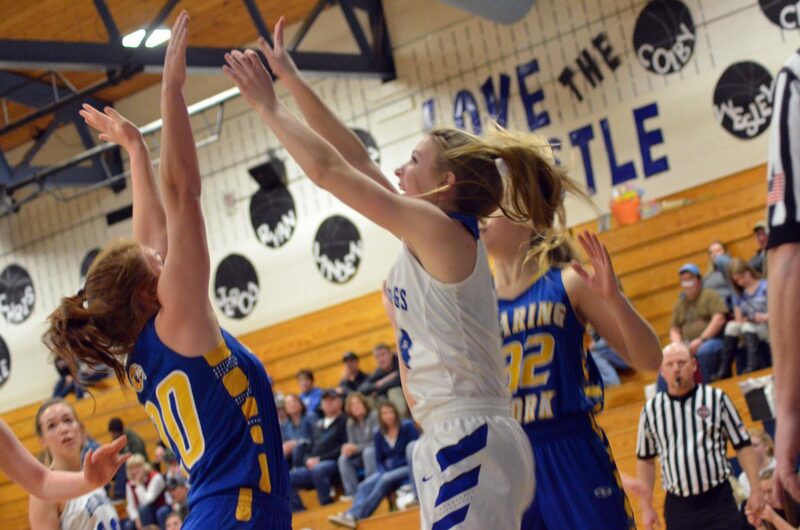 Once the ball got rolling, Hildy added a bucket from beneath with Emaleigh Papierski and Halle Hamilton joining the effort to put the home squad in front 7-5 at first quarter’s end. 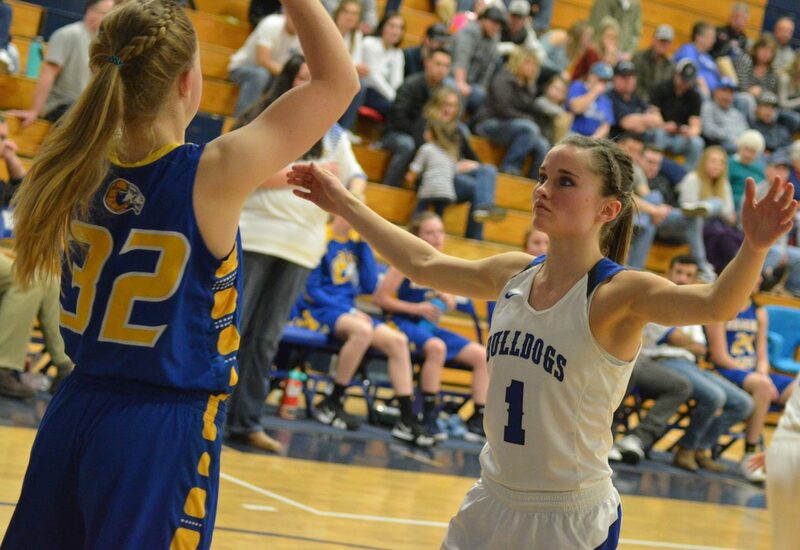 The pace picked up quickly in the second period, with a 9-2 Bulldog run in less than three minutes, with Hamilton adding two three-pointers before halftime to help her team get in front 26-9. If the first quarter was molasses, the third was cement, with more than five minutes elapsed before Hildy added a foul shot to get the action reset. 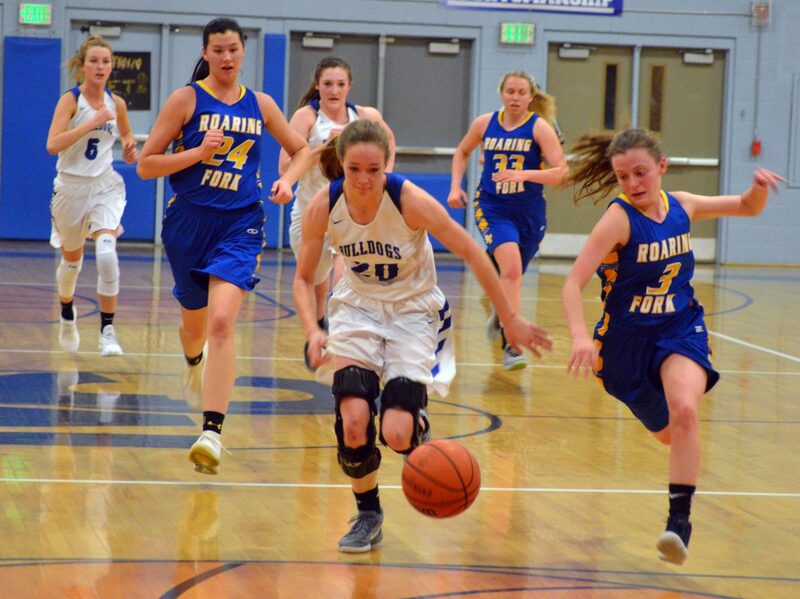 While the Rams’ Gabriela Santana kept up her reputation as the best blocker in the 3A Western Slope League with some big shutdowns under the rim, she couldn’t stop the overall Bulldog onslaught as Hamilton and Hildy kept adding points, making it 34-13 after three quarters. “We were a little out of sync, and I changed some things up,” coach Jim Loughran said. Loughran noted that although his players had fits and starts on one side of the ball, defense for the day was consistent, evident in the final minutes as Steele, Papierski and Stephenie Swindler kept up the intensity at half-court to turn steals into transitional buckets, eventually finishing 46-20. “I think sometimes even I wouldn’t want to face our press out there,” he said. Hildy and Hamilton each put together 13 points, with seven for Swindler, six to Papierski, and four for Steele. 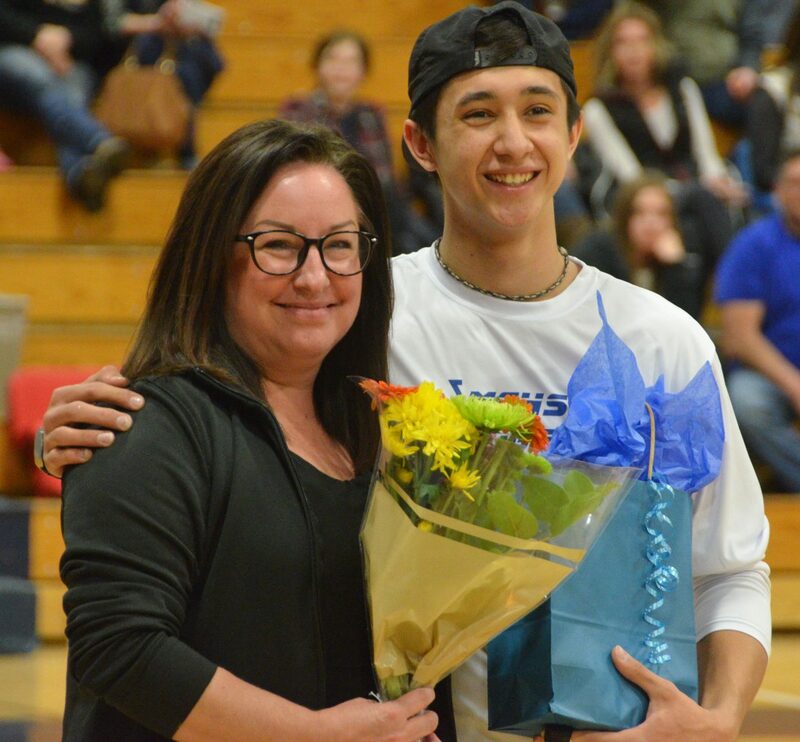 Senior Night combined with Friday’s Middle Park game was also a factor for the boys game, which began with the same sendoff ceremony for Cale Scranton, Victor Silva, Connor Etzler, Colby Beaver, Connor Murphy, Torin Reed and manager Trinitie Beckner. 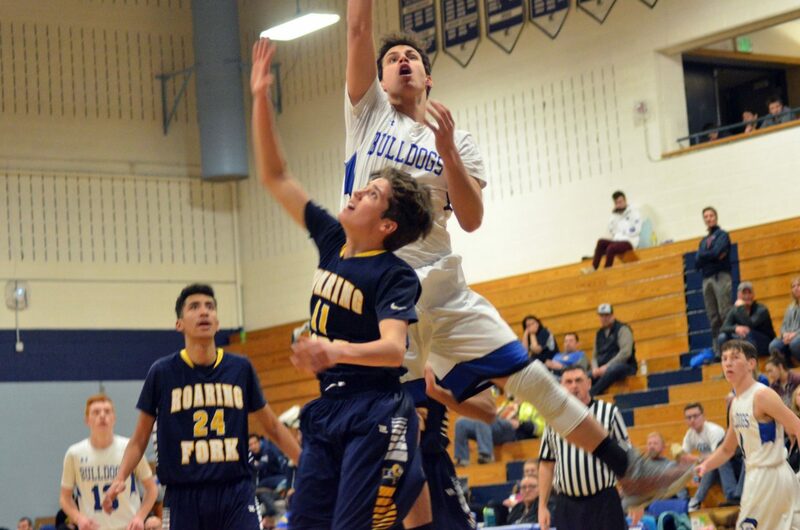 Unlike the girls, boys had a hot start as Scranton sank two quick field goals before Roaring Fork went to work on the other end, 11 straight points interrupted only by one more basket by the Bulldogs from Landen Najera in an 11-6 quarter for the Rams. 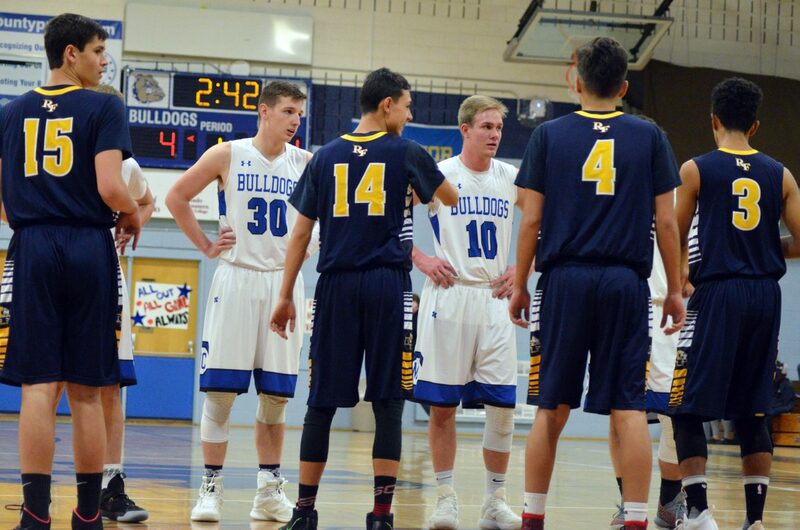 Another 10 points came swiftly before Najera scored again, and a triple by Jerod Chacon didn’t help as much as it should have as the two teams went into the locker room with Roaring Fork ahead 31-13. Following halftime performances by the MCHS cheerleaders and the Moffat County Rave Dance Team — celebrating their own seniors, among them Abigail Hall, Sambu Shrestha, Bailey Lawton and Kelsey Stauffer — an 8-7 third quarter was Bulldog boys’ best stretch with inside jumpers by Beaver and Reed and another outside swish by Chacon. Still, the Rams controlled the game flow from there, on the right side of a 15-7 period for a 53-28 win over the Dogs. Najera picked up eight points, with six for Chacon and five for Reed. 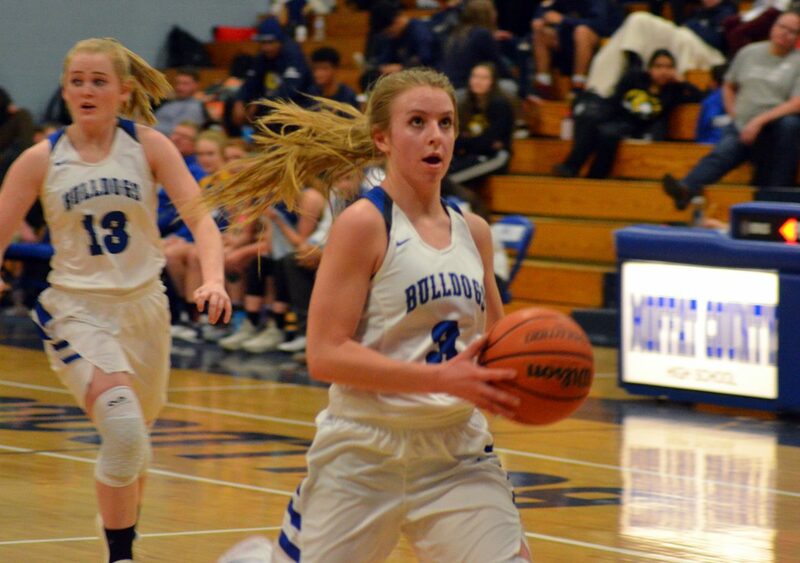 With girls 7-1 in WSL play and 14-4 overall, the Lady Dogs are all but certain to finish the regular schedule second in the conference, which will guarantee them a home game Feb. 19 to start the district tournament. 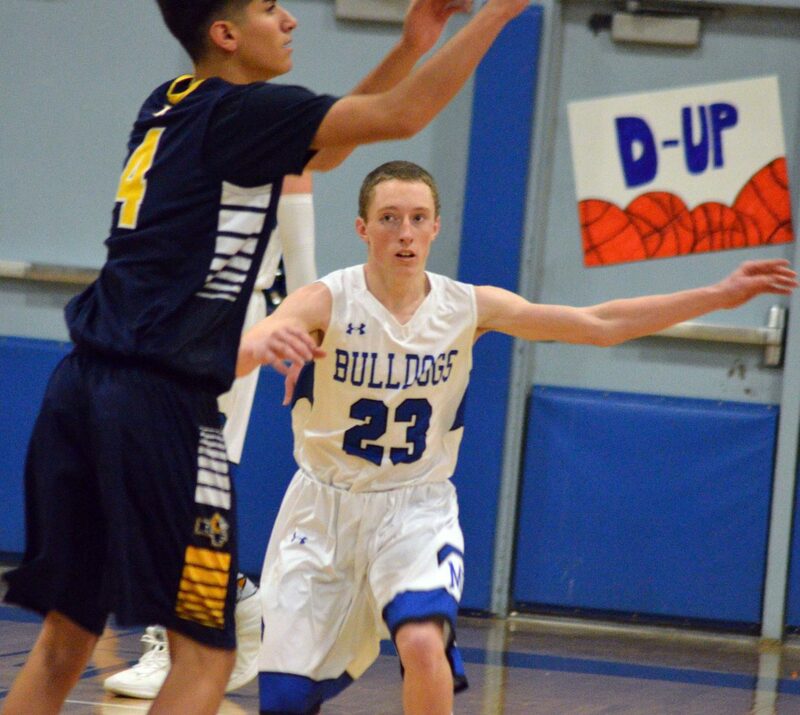 A road win against final league foe Coal Ridge Feb. 14 will solidify that position, and though Delta is all but certain to finish as conference champions, the structure of the remaining schedule is to the Bulldogs’ favor, Loughran said. “I want to play a tough team like Coal Ridge, that’s what we need right now,” he said. 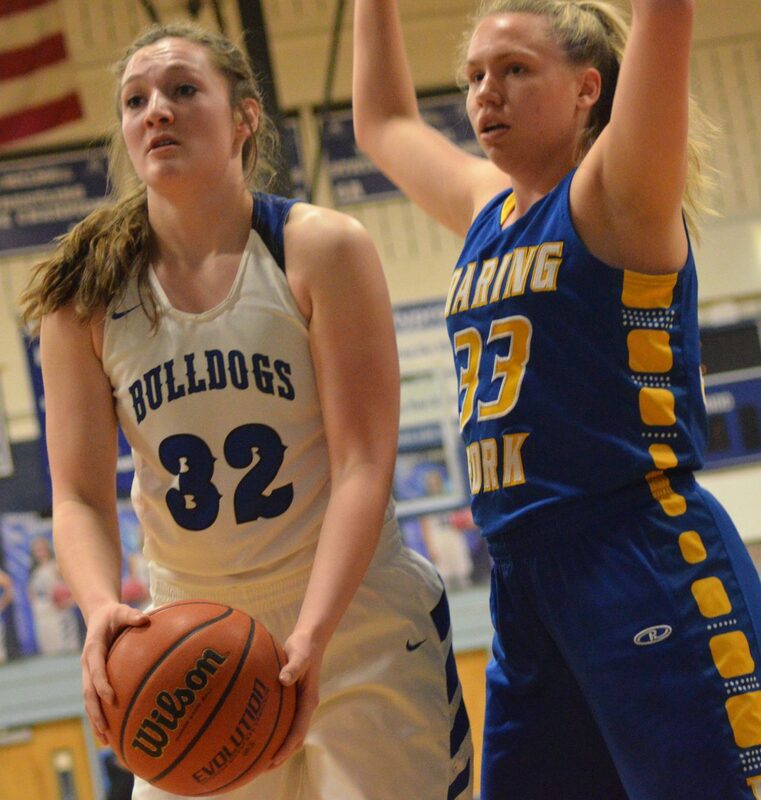 With MoCo girls facing staunch opponents like Middle Park, Roaring Fork and Coal Ridge late in the season, their skills will be tested more than Delta, whose final three games of league play are against Aspen, Olathe and Gunnison, all of which remain in the bottom four of the Western Slope and will battle amongst each other to later face Delta and Moffat County to get into the next round of the tourney. If all goes according to plan, Loughran expects to see Basalt come to Craig for the Feb. 19 game. 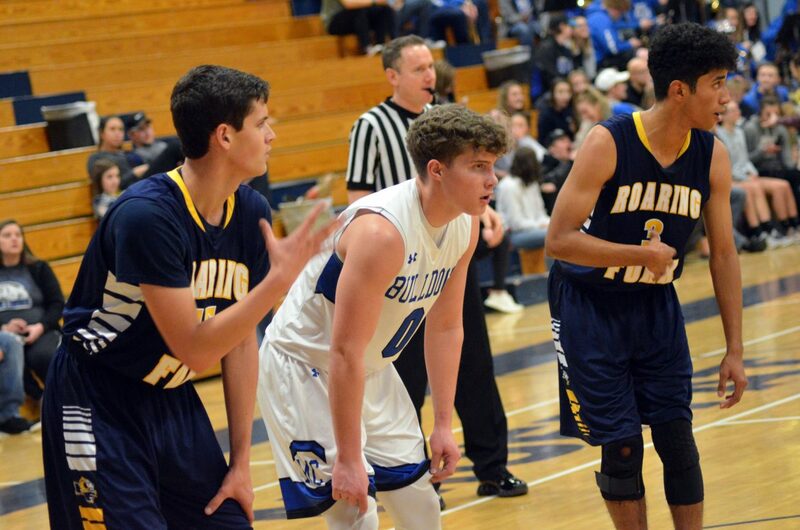 As for the boys, the loss to Roaring Fork was a blow to morale to put them at 5-13 overall, 3-5 conference, though the silver lining is the defeat ranks them at seventh. The game against Coal Ridge will help determine if they stay there or move to sixth. “Coal Ridge is definitely beatable, they’ve had a lot of changes this season,” said coach Eric Hamilton. While nothing is set in stone, as the conference rounds out the year, should they stay at No. 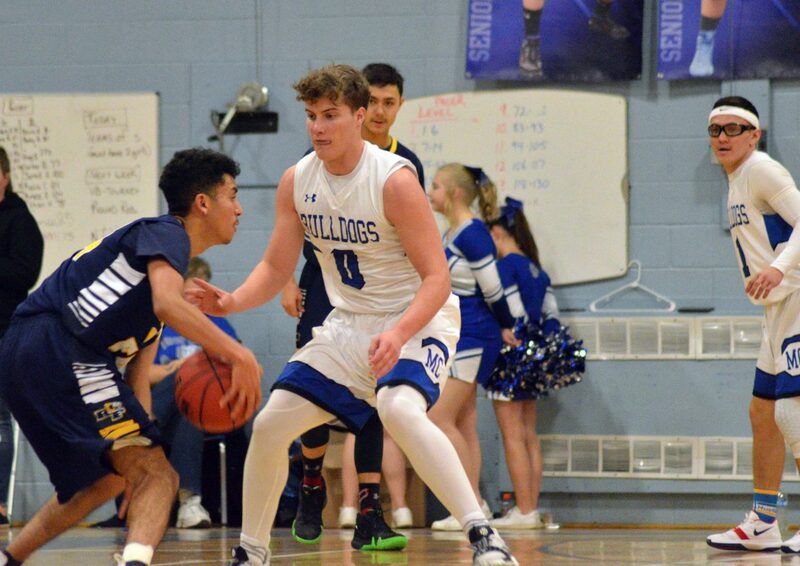 7, Moffat guys would host a play-in game Feb. 16 against the last-place team — odds say Cedaredge — the winner of which would travel the next day to the league’s second-place school. That will all depend on how Gunnison performs against Delta the same night Bulldogs face the Titans. 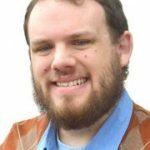 Hamilton is rooting for a Panther victory, because though the trip to meet the Cowboys would be longer, he foresees a better game in Gunnison. 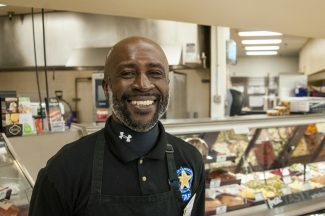 “When we played Gunnison the first time, we only lost by six, eight points, and they’re probably the best team out of the top that we match up with,” he said.